I'm writing a tiny web server running from an microcontroller. I'm having issues serving pages on not standard ports (e.g. 8080, or whatever). When the server is running normally at port 80, no problems at all but if I change it the page wont load, instead, firefox screen show the actual page's code but no rendering any elements just page´s code text. Page is hosted on the LAN (e.g. 192.168.1.1:8080), I've tried '192.168.1.1:8080' on address bar also 'http://192.168.1.1:8080' but no deal. I fear this is probably not a Firefox related issue but it works on other browsers. Maybe I'm missing specs Firefox is not relaxed for? Like, expecting a server's signature/description I'm not sending? Anyway.. Stuff do work if using the standard port 80 so I'm lost about it. Any clue or direction to make this Firefox compatible is greatly appreciated. It sounds like the server might be giving the wrong Content-Type for the response (or no Content-Type at all). You can check this in devtools: go to the Network tab, find the request/response for the page in the list, then look under Headers > Response headers > Content-Type. I have also a tiny just-barely-working httpd on a custom port. As few server response lines as possible, probably breaking standard practices (it's just sudoku, not anything serious). 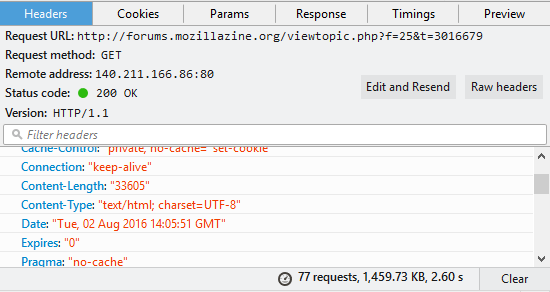 Firefox/47 does render the html ok.
Do you close the connection after every response ? Thanks DanRaisch for moving this into correct place. Thanks oh5nxo for the example. Thanks libertyernie. You were right! It ends that... I was not sending a Header at all! It was just a matter of inserting the missing header data and it started working despite of alternate ports. Now I think I can be a bit _less_ pretentious about calling it a "web server", just a step forward. I'm not experienced and I really thought everything need by browsers were information included in <head> and meta tags. There's a really nice old algorithm you might find useful if you ever have to create Date: or similar headers. If you have limited time-handling on your uC libraries, or whatever. Dates must contain the (IMHO pointless) weekday name. Many thanks. It will be useful for sure. I will need this type of conversion for other purposes as well. I'm wondering about not sending the 'Date:' field but I'm unsure how bad is not sending it, that's something I must research. // Keep-Alive: timeout=5, max=100 --> not used. Not meaningful against 'Connection: close' ? As for time: Purpose is getting the most cost effective solution for a non-critical appliance. So not inserting an RTC to this. Instead, getting epoch from NTP. I leave here the code Im using in case you find it useful. I managed to change to "local" strings in the above example so you can understand what's being sent, it´s going originally from PROGMEM so I hope theres not any typo in those transcriptions. Function ECSP is just sending stuff to ESP over hardware serial. timeset function and timecontrol variable is just a timer interrupt based delay to avoid getting stuck inside while in case of unsuccessful connections. This is not taking into account network delays correction and other NTP details for the most accurate timing but useful already for some objectives. Quite long code... Im sure it can be optimized but it show the principle. Ah, ok. I thought that you might have your hw clock as separate year, m, d, h, m and seconds. Chunked transfers are no more complicated than the traditional way. You just add %x\r\n (size of the piece) before and \r\n after each piece of data. 0\r\n\r\n after last piece. The wifi-module looks nice, btw. Yeah the module is nice, it's being very popular among makers. The chip is quite impressive, a 32 bit RISC with TCP/IP/Wireless stack packed small. It's from a relatively new Chinese company, support still so so... stuf like endurance, long term reliability are still unknown I think. Consumption average is around 200mAh but it seems that really huge current spikes around average is the normal operation, probably from TX bursts. Definitely needs a good tank capacitor and noise filtering around it.